Den här veckan går i kärlekens tecken. Inte för att jag behöver någon speciell dag för att visa min kärlek till dom jag älskar. Men jag har inga problem med en sådan dag ändå. Man kan aldrig ge för mycket kärlek! This week it's all about love. Not that I need a special day to show the people I love how much they mean to me. But I don't mind, you can't show too much love! Simple and clean as I like. Congratualtions ! A goregous clean and simple card - a great design. A beautiful CAS card, fabulous embossing and wonderful colours with your hears. How lovely! I love the glossy red heart! Thanks for joining the Little Tangles Challenge! Thanks for joining us this week at Charisma. Such an adorable card! Hello dear friend! it's been ages. glad to see you stop by Little Tangles. 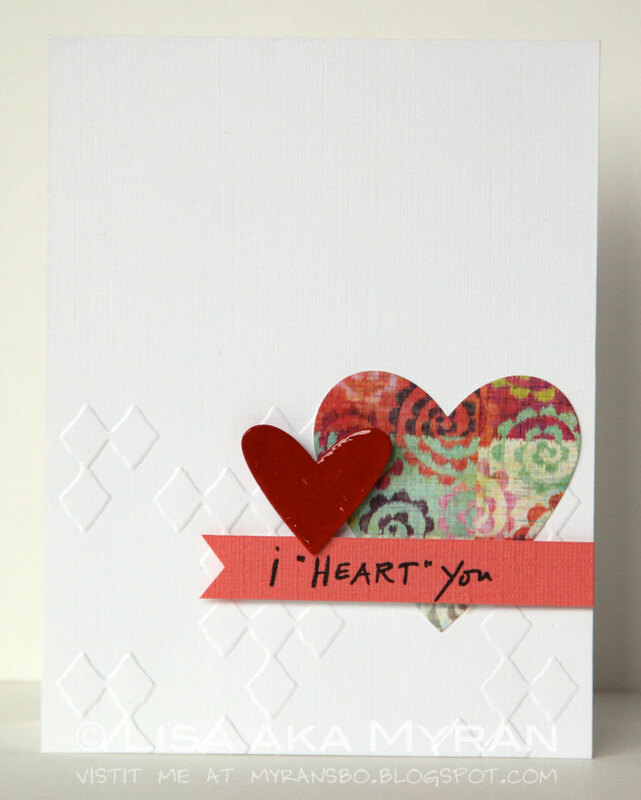 Your cards are always superb... love the embossed background and the stacked hearts. Great hearts and texture, so artsy! Thanks so much for playing along with us this week at CAS-ual Fridays! Gorgeous cas card Lisa - love it. Love the simplicity of this card! The embossing is wonderful and I love the pattern on that heart, thakns so much for playing along at Little Tangles! What a beautiful card!!! Thanks for playing along with us at Little Tangles!! Lovely CAS card! Thanks so much for playing along with us at The Pink Elephant! What a fantastic card. Love the pop of colour on the white background!